behold the power of the Web! I saw an opportunity to test the power of the Web today, when a video snippet from the The Daily Show came into my Twitter feed. 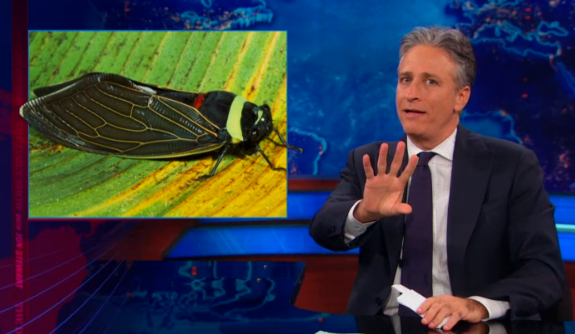 At 2:00 Jon Stewart references an entomological factoid/stereotype in a joke about the state of gun control in the U.S. I’m a sucker for entomological references outside the world of science, especially ones that are wrong. So how did this one score? Of course some periodical cicada species are famous for their synchronized 17-year life cycle—Magicicada septendecim (Linnaeus, 1758), M. septencassini (Fisher, 1851), and M. septendecula (Alexander & Moore, 1962)—but there are about 2,500 species of Cicadidae. A small minority of species take 17 years to develop. What about the species represented in the accompanying image? Doesn’t look like Magicicada to me, not that I’m an Auchenorrhyncha specialist, but at least it’s really a cicada! Tacua speciosa (Illiger 1800). Does it have a 17-year life cycle? Wikipedia doesn’t help. Google Scholar? Seems like almost nothing is known of this species, or at least very little has been published. The Encyclopedia of Life’s Tacua speciosa page doesn’t offer too much information either. This was perhaps the most useful page I could find about the species—http://www.cicadamania.com/cicadas/tacua-speciosa/—which still leaves me hanging with respect to understanding this species’ natural history. In summary, this exercise drove home two important points: 1) the Web is an increasingly useful tool. I was shocked at how little time it took me to determine this species (not sure I’m right, though!) and how many resources, both amateur and professional, I had at my disposal to get the answer. Again, I literally know next to nothing about cicada taxonomy. So, who needs keys?! (note to self: turn off comments for this post). 2) We know so little about the life histories of even the most conspicuous insects. This species is HUGE, colorful, charismatic, and frequently photographed (but not collected? Only 4 specimens listed in the Cicada Database) , yet we apparently know very little about its biology. Not sure the Daily Show picked the best image to accompany their joke, but it’s certainly a beautiful insect (and it’s a cicada, so no taxonomic #fail). In the meantime let these beautiful images of Tacua speciosa wash over you. T. speciosa probably has a 2-7 year life cycle, and is not a periodical cicada, but it might be proto-periodical (but most likely is an annual species). The only document specifically about the T. speciosa I’ve found is Boulard, M. 1994c. Tacua speciosa, variete decolorata n. var. (Homoptera, Cicadidae). Revue Française d’Entomologie. 16: 66. — however that document usually costs around $60, which I’m not ready to invest in. Thanks, Dan! I knew someone out there would be able to answer my question. I did come across that article in my searches, but I didn’t want to take the time to order it. Let me know if you want it … maybe I can find it for cheap (wink wink). I think I want that document. Boulard’s book about the cicadas of Thailand is a treat. I wish he did complete books for every country in south-east Asia.